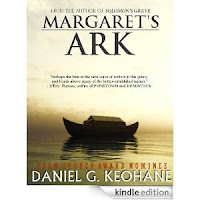 Margaret's Ark: the debut title for Other Road Press from Bram Stoker Award nominee Daniel G. Keohane. Trade paperback and eBook formats are available everywhere. On April ninth, thousands of people wake from the same dream, angels instructing them to build a biblical ark in their front yard, or the town square or little league field. Anywhere, to prepare for the worst natural disaster to strike the world since the days of Noah. A widowed California high school teacher risks everything to build a boat in the sixty days she is given. A homeless and self-proclaimed prophet of God preaches across Boston's waterfront, unaware that he is not alone in his visions. A young priest is torn between the signs around him and the skepticism of his Church. In the end, only thirty people may board each boat. As the world slowly comes to grips with events unfolding around them, they must weigh their own faith in the exceptional and identical visions of so many people. The skies are clear, without a hint of rain. But if the dreams are true, something terrible is looming on the horizon. 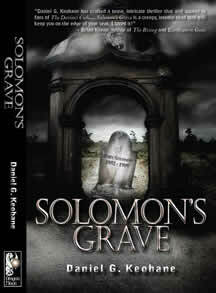 Also, be sure to check out Daniel's debut release, Solomon's Grave, from Dragon Moon Press. Solomon's Grave was nominated for the Bram Stoker Award for Best First Novel of 2009. "...a dark, intricate Biblical thriller not fit for Sunday School, but more than adequate to while away the evenings in suspense. With a solid first effort, Keohane provokes thought and inspires dread, teaching an important lesson: Providence is often the most frightening thing a man can face.."
"Daniel G. Keohane has crafted a tense, intricate thriller that will appeal to fans of The Davinci Code.... Solomon's Grave is a creepy, intense read that will keep you on the edge of your seat. I loved it!" Nathan Dinneck's new role as pastor may be shorter than he expects. For thousands of years a secret has been hidden from the world and protected from those who covet its power. Popes and Kings have sought it. Theologians and historians have debated its very existence. In every generation since the days of Solomon, one person is chosen to keep its secret, protect it from an ageless group claiming the treasure for their own dark god. After millennia of searching, they are finally closing in on their prize. Evil has followed Nathan home to Hillcrest, Massachusetts. Nightmares of temples and blood sacrifice, visions of angels and cemeteries foreshadow a dark battle to come. In the balance hangs the lives and souls of those chosen to protect history's most holy relic, perhaps even the gateway to heaven itself. 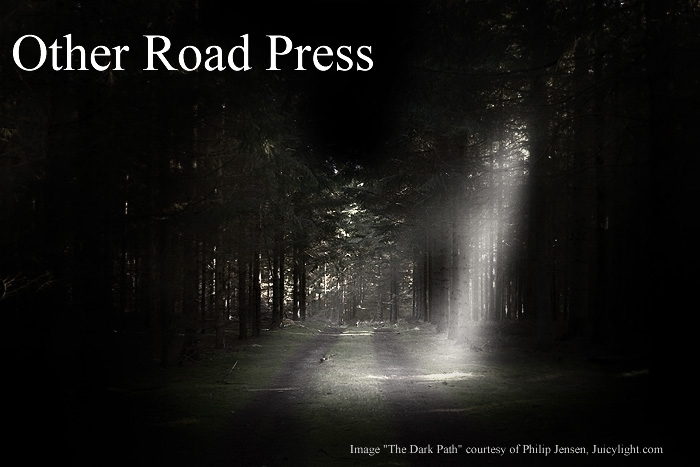 Other Road Press is, for lack of a better word, the Grand Experiment of Bram Stoker-nominated author Daniel G. Keohane, author of the Bram Stoker Award nominated Solomon's Grave, Margaret's Ark and Plague of Darkness. Money should always flow to the writer, but it rarely does. Most authors get paid such a small pittance for royalties, if they ever get paid at all, while bearing the brunt of the responsibility for marketing and sales. Don't get me wrong, there are a ton of terrific small presses out there, but I decided it was worth trying to see what would be involved in taking on the publishing role as well - not to pay ridiculous rates to a self-publisher, either, that is the other extreme of publishing which I don't care to venture into - but to format and distribute a novel myself using the tools out there in this modern age which cost nothing but a serious commitment of time, a commitment we as authors are mostly responsible for, anyway. Hence, Other Road Press was born. The first book to come out of this project was Margaret's Ark, one of my favorites and which, I feel, epitomizes my recent style of blending themes of faith and suspense. 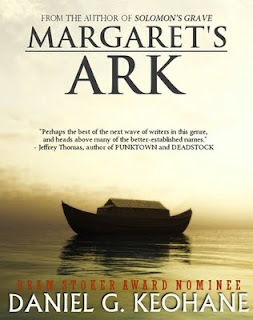 Whereas Margaret's Ark was well-received by many editors over the course of its original marketing, no one could ever decide where to pigeon-hole it genre-wise. Part suspense, part horror, part religious/Christian fiction, it never fit neatly into the secular or religious sectors. And in many ways, that's what Other Road Press is about. Finding a home for novels where the characters struggle with every day, and supernatural, experiences, while still swearing and spitting and praying and getting disemboweled, depending on the story of the moment. Right now, it's an experiment, a venture. Would I ever consider venturing out as a more global publisher, with additional authors and an expanded title list? Sure, if the right book came along. Something that strikes a nerve, elicits an emotion, but also has a theme in some way around faith and how we grow into, or fall from, it in this world, and others. Religious (doesn't necessarily be Christian, though I would normally slant towards the Judeo-Christian worldview, being a believer myself) horror/suspense is a narrow market, but there is a market.